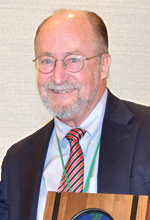 The Association of American Geographers awarded Bill Derrenbacher, Esri’s executive adviser, the 2015 James R. Anderson Medal of Honor for his distinguished service to the profession of geography. 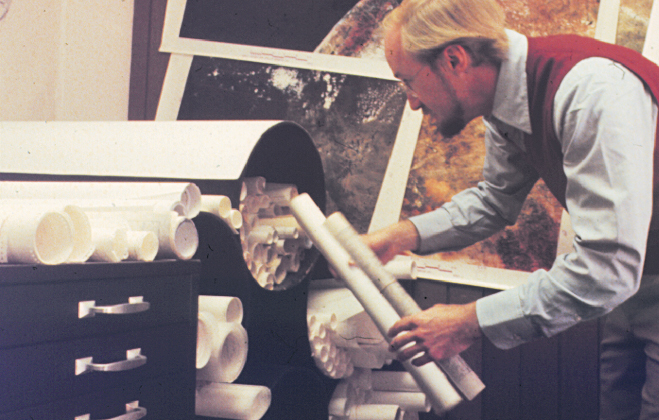 Having devoted 40 years to the innovative application and understanding of geographic science, Derrenbacher has influenced untold organizations. A leader and a driving force in modern-day applied geography, he has played a significant role in the proliferation of GIS around the world. Derrenbacher and the team he built at Esri have designed geospatial data methods and tools that have become best practice standards for land management and geodesign. Because of his work, more than 1 million organizations have a better understanding of the world and are making wiser decisions. Derrenbacher joined Esri’s founder, Jack Dangermond, in the mid-1970s to help build what is now the foremost GIS company in the world. Esri’s early projects often involved the systematic assessment of land capability and suitability using digital databases. Derrenbacher performed these assessments by applying a new methodology called integrated terrain unit mapping, which consolidates a number of terrain features, such as vegetation and soils, into map units to help evaluate land-use opportunities and constraints and, in turn, determine best uses and management practices. In one of the most far-reaching undertakings of his career, Derrenbacher organized and led a large team to devise the modern data format standard for the United States’ Defense Mapping Agency’s (now the National Geospatial-Intelligence Agency) digital vector map products. The team created the Digital Chart of the World, the first global GIS database. The production tools developed for this project are now used by national mapping agencies around the world. 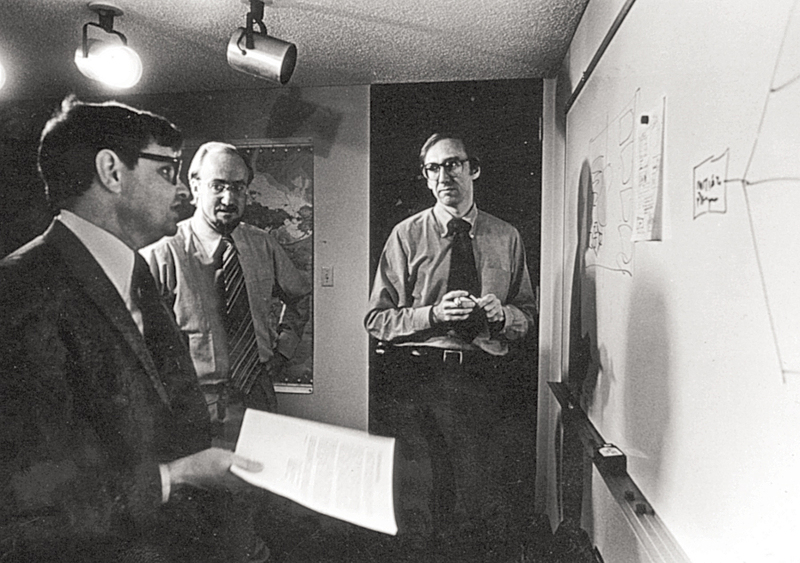 From left to right, Kent Smith, Bill Derrenbacher, and Jack Dangermond—three of Esri's trailblazers in the 1970s. Esri subsequently released its own version of the Digital Chart of the World. 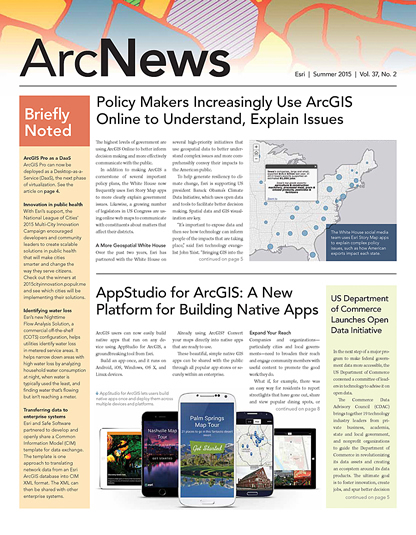 It became the starting point for Esri’s initial digital data products and, eventually, the data content that is now developed and maintained by Esri in ArcGIS Online. Users can now stand up map and associated data in ArcGIS Online to conduct ever deeper and more wide-ranging analyses. Derrenbacher also established the Esri Professional Services division, which, under his leadership, was (and still is) integral to advancing applied geography methods that effectively address real-world opportunities and challenges. Esri Professional Services regularly breaks new ground, driving novel requirements and functionality into Esri’s ArcGIS platform. The team then shares its tools, workflows, and lessons learned with Esri users and partners. While working on projects, Derrenbacher and Esri Professional Services created a framework and workflows that other organizations could use to collect, build, and analyze data. This led to the 2014 release of GeoPlanner for ArcGIS, a web solution built out of proven geodesign methodologies that provides planners with a geographic data- and science-based structure to use to address local and global issues. Bill Derrenbacher was trained as a geographer at the University of California, Berkeley. Since the early days of Esri, Dangermond and Derrenbacher’s ideology of sharing knowledge and building understanding has remained foundational to increasing the use of GIS in applied geography. This vision continues to inspire and allow the company to be open, agile, and innovative. Derrenbacher continues to inspire the next generation of geographers and GIS professionals, and the Anderson Medal of Honor is a fitting tribute to his contributions to the field of applied geography. Derrenbacher held the position of director of the Esri Professional Services division until 2014. He currently serves as Esri’s executive adviser. Learn more about Derrenbacher’s influence on GIS and applied geography at esri.com/aagaward.